Doodlez offers innovative, engaging character properties developed and supported from our studios and fueled by artistically pioneering, and creatively bold talent. We specialize in licensing character-based artwork and content to retailers and manufacturers in the consumer merchandise, publishing, and online media sectors, and much more. Our properties embody cute, cuddly, cheerful tween-and-young-adult oriented characters popular with collector audiences of all ages. These characters inhabit a world defined by enduring friendships, "joie de vivre", and strength in overcoming obstacles. Please peruse our site at your convenience, and see what we have to offer. We are always interested in hearing from you. April 3, 2005 --- The selection of art and products in the shop has expanded significantly, with many Ballet and Dance related items, among others. 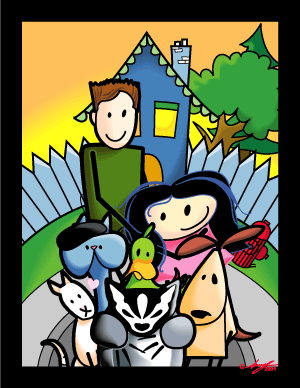 December 5, 2004 --- Doodlez Studios introduces the first issue of "Doodlez Zoo," a comic strip featuring the Doodlez Studios characters, and exploring their world. November 15, 2004 --- Doodlez Studios launches its new web site, complete with shop, new art, and licensing sections. January 4, 2003 --- Doodlez Studios joins NMBC (Northwest Minority Business Council) to enhance its marketing connections within the minority business sector.